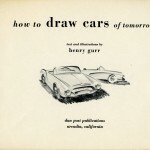 This is the first in a series of articles focusing on Bob Gurr’s 1952 book, “How To Draw Cars of Tomorrow.” Click here to review all articles in this series. 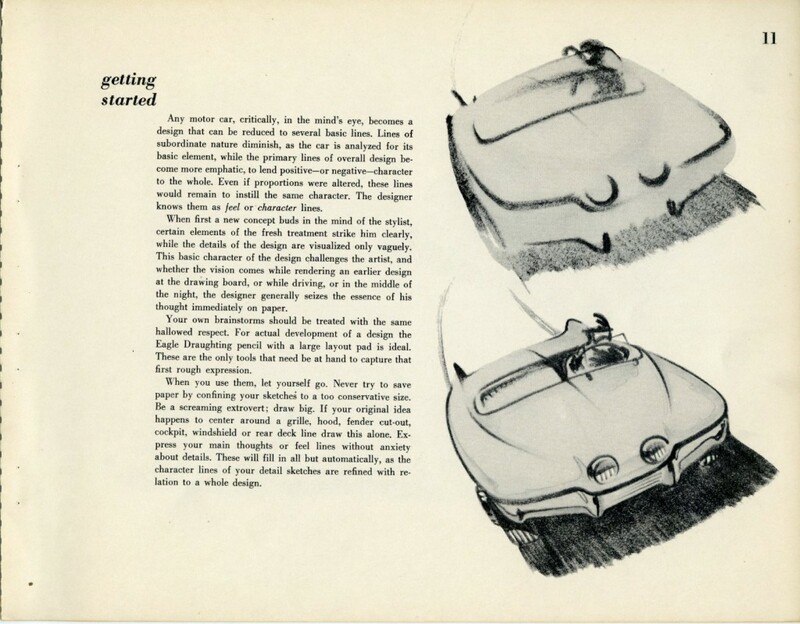 Who wrote the first book on how to design a car? What a great question, and I’ve been searching for that answer for the last several years. 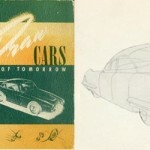 There are booklets by General Motors in the ‘30s and ‘40s showing the process of design, but not teaching how. These books and booklets are more of an advertising piece that illustrates the process – but they are expertly done. But why would this be a focus of Forgotten Fiberglass? 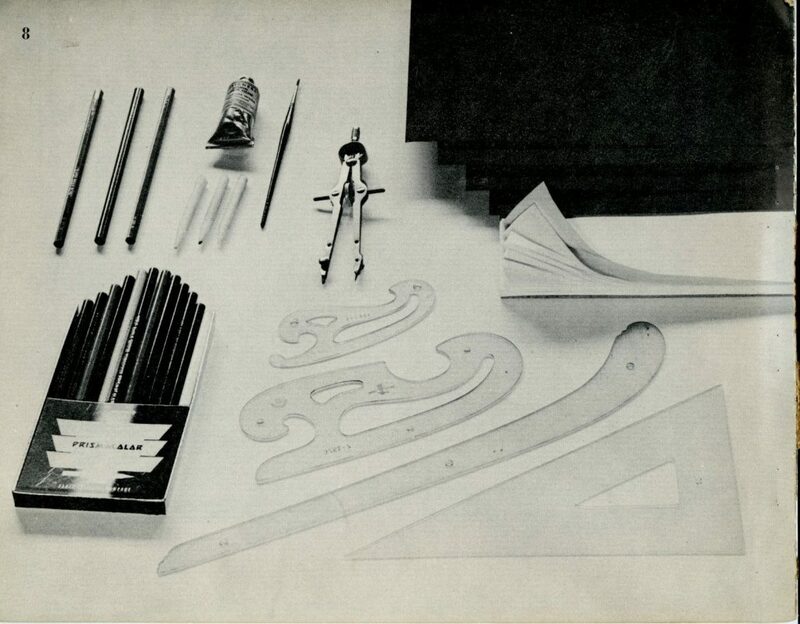 Well….many if not all of the young men who designed and built their own fiberglass bodies did so by starting with a sketch, an inspiration…a dream. And this “beginning point’ started with innate talent nurtured for years, and/or guidance from a book such as this. 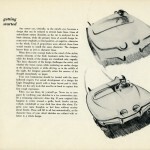 It was the creation of design books like the one we’re discussing today – published and released in 1952 which was the beginning point for the development of fiberglass sports car bodies – that threw gas on the flames of inspiration for these young men, and resulted in many of the fiberglass sports cars we see today. 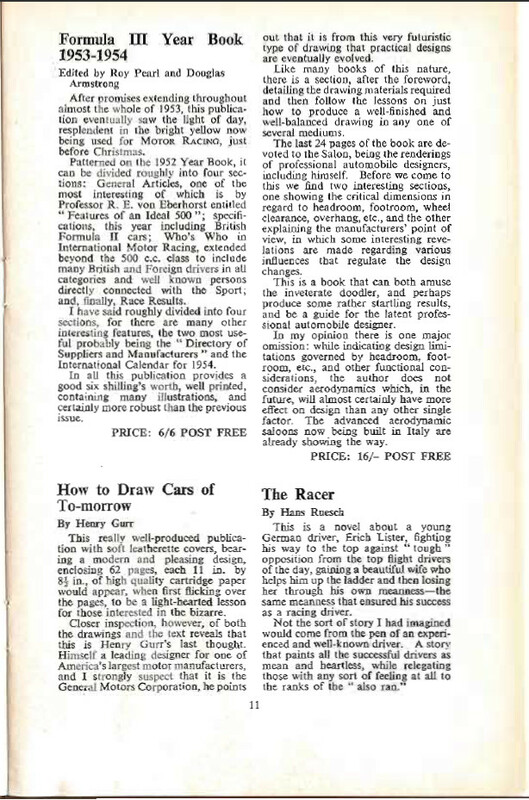 In the ‘40s there were articles written in Argosy and Esquire Magazines showing how to design cars mainly targeted at the young man wishing to learn more concerning the process. 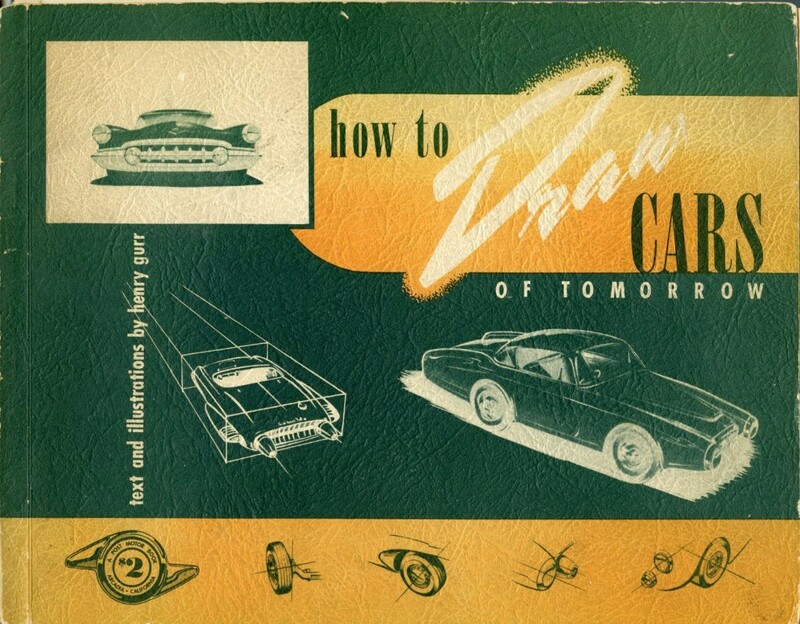 In the late 1940’s you could even sign up for a correspondence course that began the process of teaching interested students how to design cars. 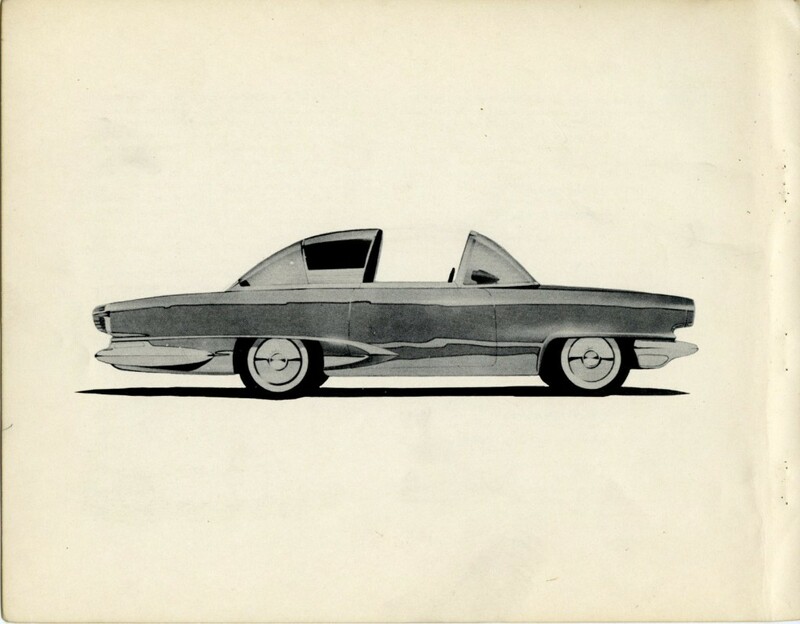 This was setup by Harley Earl and Richard Arbib. 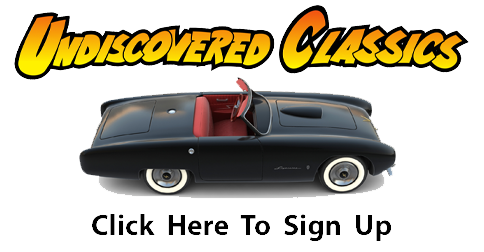 Click here to learn a bit more of what they did back in the ‘40s with this course. This is the earliest ad I've found advertising Bob Gurr's 1952 Book - This ad appeared in the January 1953 issue of Motor Trend. Several years ago, I was lucky enough to track down and meet with Bob Gurr. Bob is in great health and just celebrated his 80th birthday last month. Happy Birthday Bob! 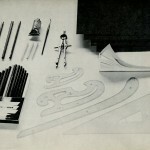 Bob has helped us document the early history of design and the use of fiberglass in many ways. 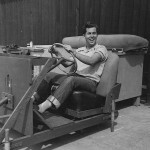 He not only visited with Bill Tritt when the Brooks Boxer was being built in 1951 (Bob produced one of the the earliest known pictures of the Glasspar G2 ever found) but also designed the Disneyland Autopia cars and worked with both Glasspar and Mameco to get them built. Bob is abundant with history from this era and was retained by Disney to design their first transportation rides including the famed monorail – my favorite ride growing up as a visitor to Disney. In every way, Bob Gurr is one of my design heros, and I’m honored to call him a friend. 1949 September: Robert (Bob) starts Art Center, Minnie Escobar’s boarding house at 457 S. Norton, Los Angeles. School $212 per semester, Room & Board $15, Edith sends Robert $25 per week to cover all living expenses. Here A Young 20 Something Bob Gurr Tests Out A Mock Up For Seating Dimensions at the Art Center - Circa 1950. Photo Courtesy of The Bob Gurr Collection. During his time as a student, one of Bob’s instructors at the Art Center was Strother MacMinn, and “Mac” became a mentor and a friend. 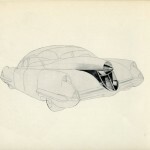 Mac was at the beginning of his career at Art Center – a career that would span over 40+ years in automotive design, and at that time was heavily involved with activities at the school. 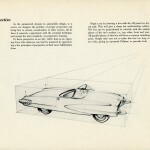 But Mac wanted to do a book on auto design in 1951 – and his friend Dan Post wanted to print it too. 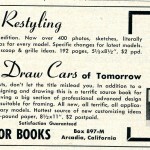 Dan Post was an automotive book / booklet publisher from Arcadia, California who wrote and published the earliest known books on custom cars starting in 1944 – during World War II (See Rodder’s Journal, #45, 2009 for full Dan Post story). 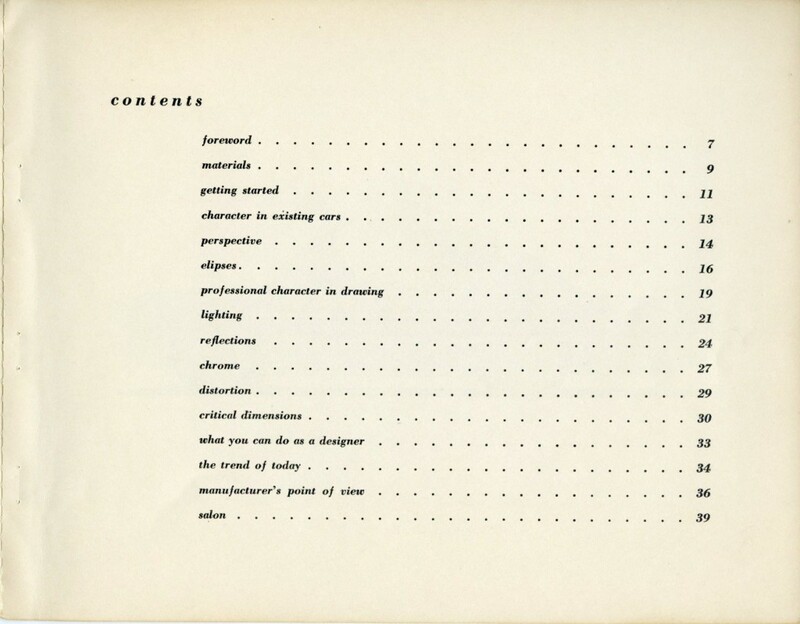 Dan eagerly started working on the book in ‘51 and began writing what would be the first draft of the content. Or at least he started. 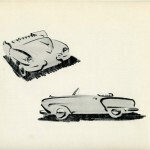 Meanwhile, Mac had put Bob Gurr in touch with Dan Post, and Dan put Bob to work on his first project creating the cover art for Post’s Duesenburg book first published in 1951. 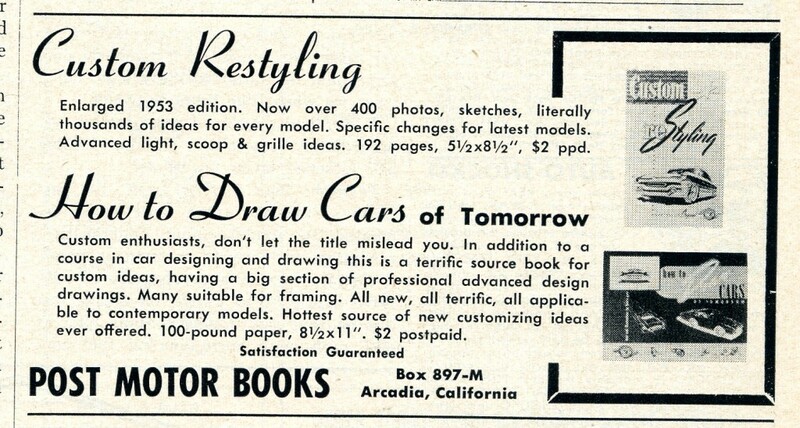 The “How To Draw Cars of Tomorrow” book progressed – but not quickly enough for either Mac or Dan Post. So they were on the fence – they wanted to do the book, but each didn’t have the time to dedicate to the project. 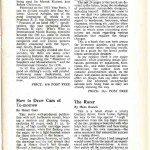 Mac asked Bob Gurr, now 20, to take the lead, and Bob started full-tilt and began to put together the book that both Mac and Dan Post had envisioned. Bob worked on the content and drawings and started to seek work from other Art Center students for sketches, drawings, and designs to contribute. 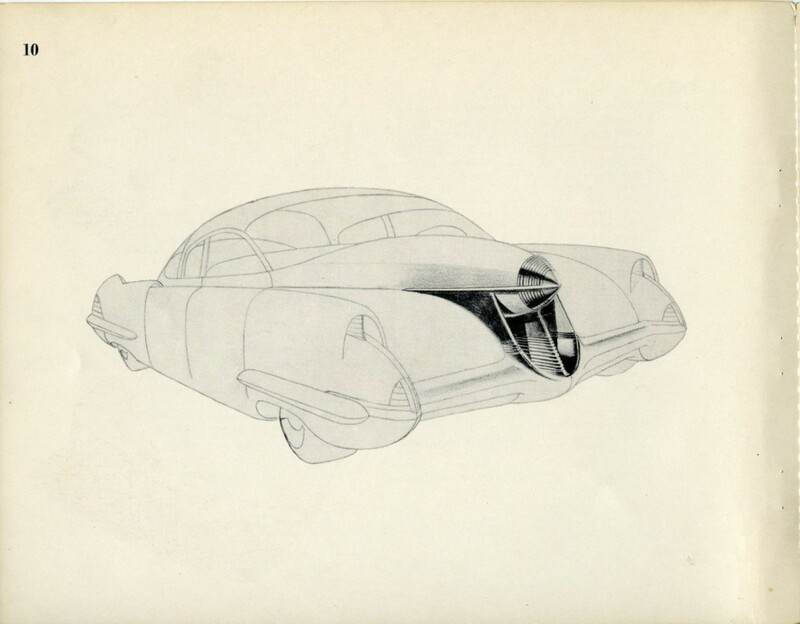 At the same time, Dan Post had gotten ahold of quite a few General Motors drawings from 1941-1942 and a few postwar drawings too, so the book came together over a period of months as a combination of all of these elements. 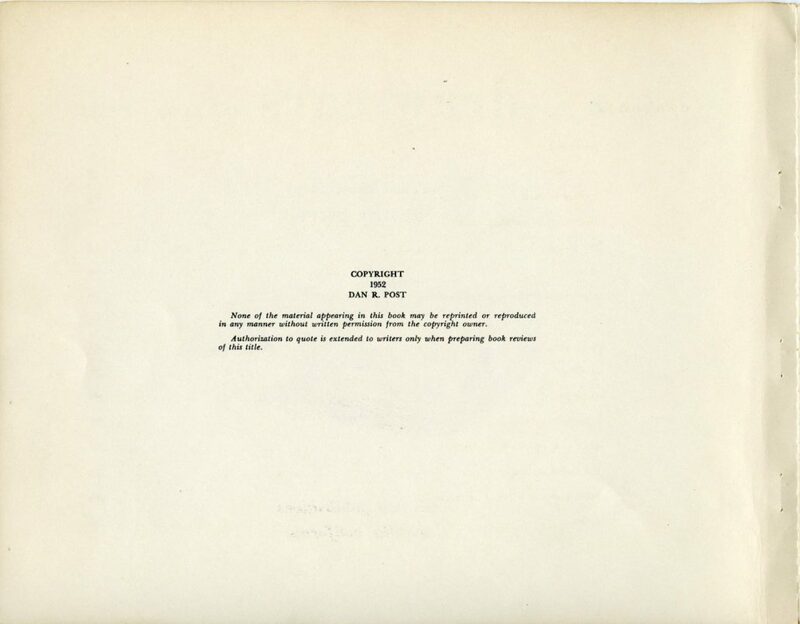 To expedite the project, Bob dedicated every Saturday working with Dan on the book, and by the Spring of ‘52, the book was finished and ready to go to print. Bob Gurr was just 21 years old. By late ’52 and early ’53 the book was being sold across the country. The target audience were interested young men who wanted to learn all about car design, how it was done, and how they could learn to do it. 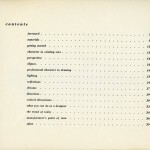 According to Bob, the book was not intended to be used by students at Art Center. I found that fact interesting, and I still wonder why this was the case. 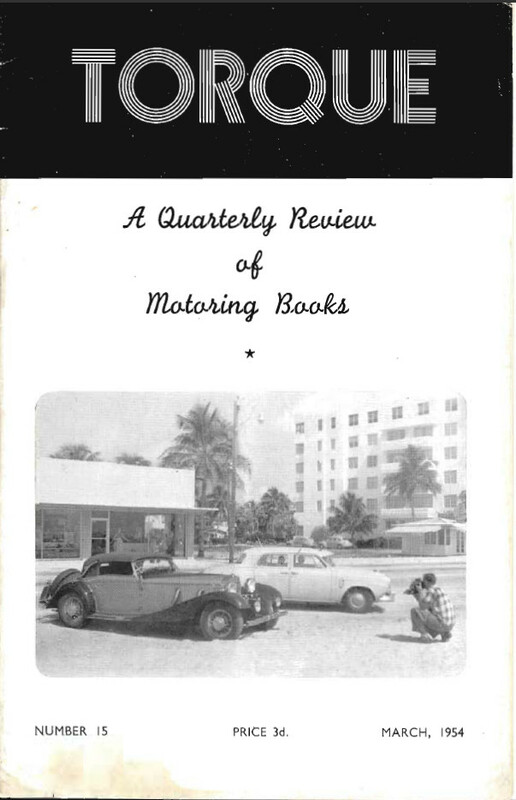 Dan Post had avenues to sell the book thru advertisements in automobile magazines, and Bob says libraries as well, so I’m sure sales went well. “About a month before June 1952 Art Center graduation, I was sent to Detroit as per a request from GM to Art Center asking them to send me immediately. I was to meet Johnny Thompson, the Art Center job placement person. 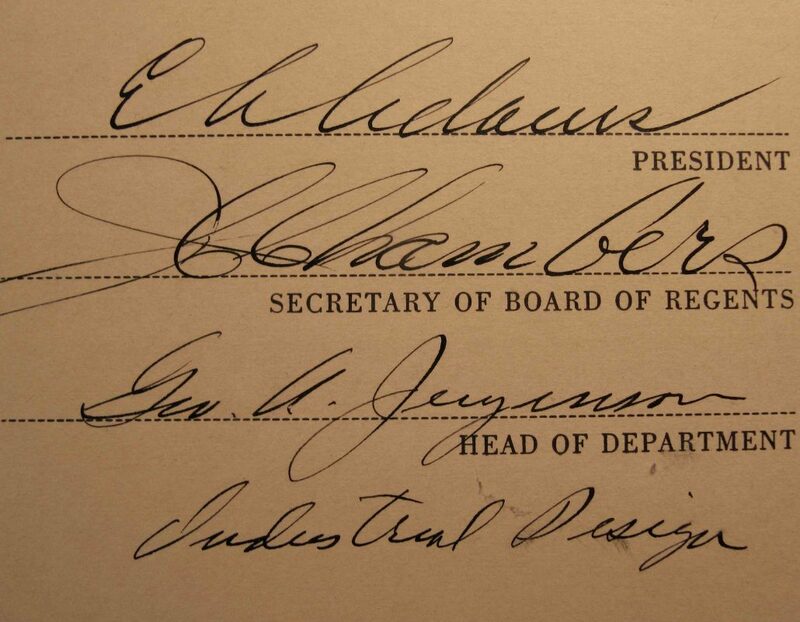 In the course of two days after my arrival in Detroit on May 14, 1952, a “deal” was made between ex-GM designer Frank Hershey at Ford and Thompson resulting in me being ordered to report to Ford rather than GM. I learned later that car companies regularly “raided: incoming students, particularly the ones that had showed the most talent. These students were always requested before graduation so as to avoid losing them to a competitor. Hershey later was the principal designer of the 1955 Thunderbird. Of course I had to ask Bob for a picture of his diploma so I could be the first to “ask to see it” and we here at Forgotten Fiberglass could celebrate his graduation which would have occurred in May 1952. 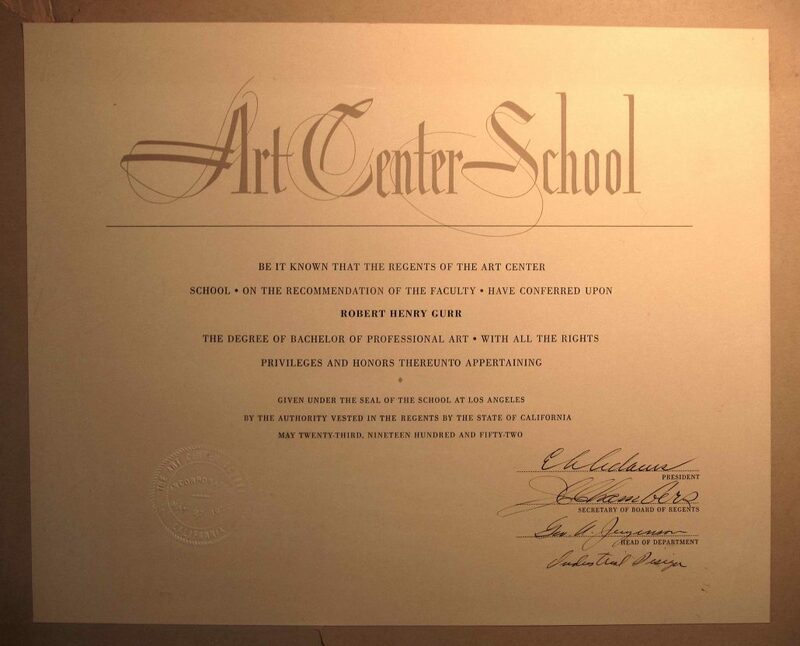 So…for the first time here’s a photo of Bob’s “Art Center” diploma. 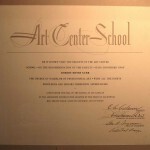 And…we can now be the first (in 2011) to congratulate Bob for his Art Center graduation – achieved back in June ’52. Bob officially joined the Disney team in January of 1955. 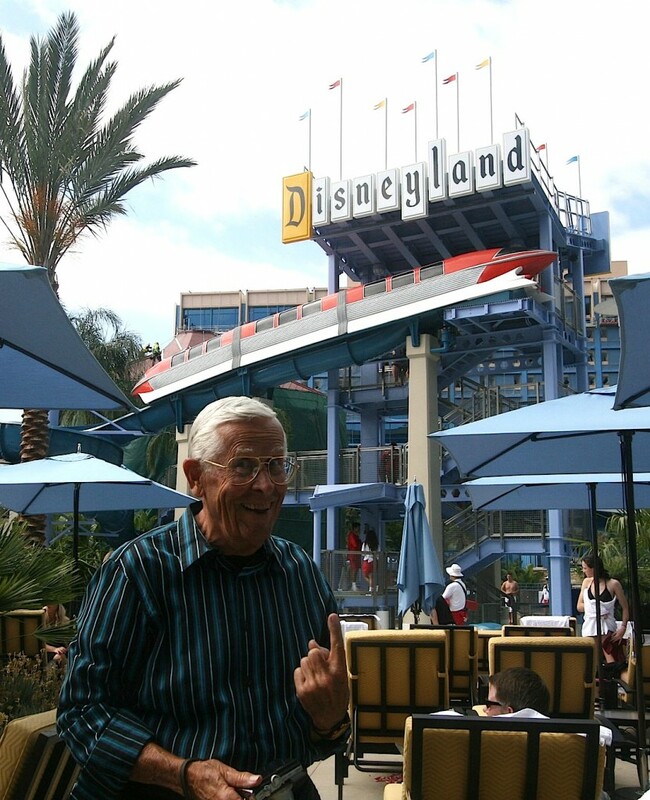 Within a short period of time, Bob designed the first monorail train ever built in the United States – and that’s the beginning of another career that Bob Gurr is best known for – his Disney years. That, my friends, is a book unto itself (as you’ll find out at the end of this story). 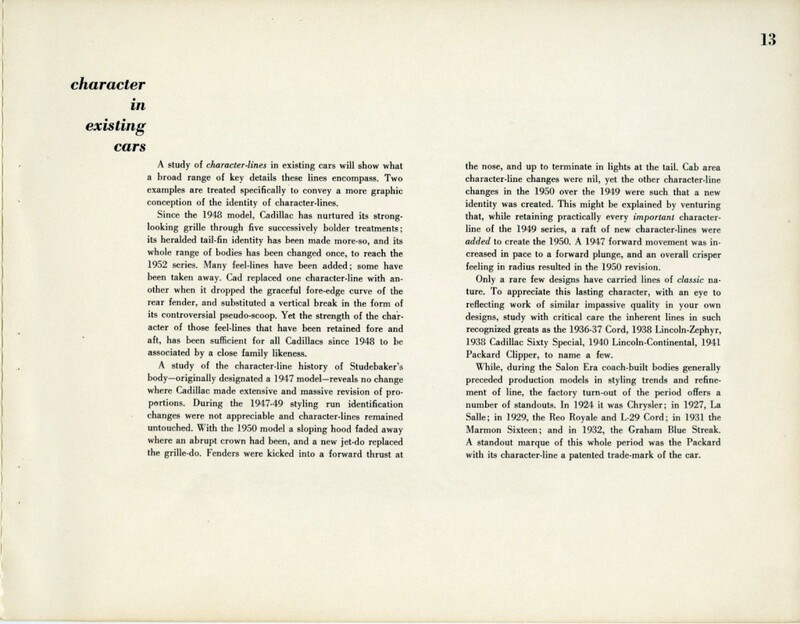 So now….let’s get into Gurr’s 1952 book and see some of the initial pages. The book is 62 pages long. Let’s review the “Foreword” of the book to get a sense of how Bob envisioned the book to be used. Progress in motor car design has been contingent to a vital degree upon original conceptions from the vivid minds of young artists. 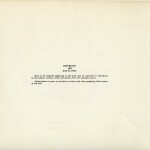 This is the irrevocable record reflected in the past and the present of the industry. 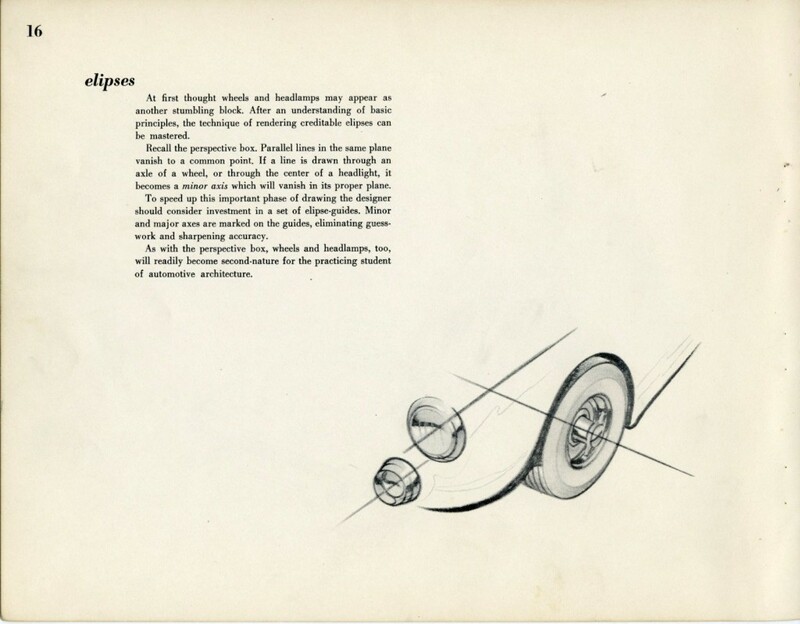 Here is a book to light the guideposts for the pencil piddler – and, as well, for the latent professional automobile designer – that motor car styling may continue to progress. Comprehensive primary text and graphic supporting illustrations pick up each would-be stumbling block in the potential designer’s progression and make it known and understood, before following the design path to the next element toward professional finesse. 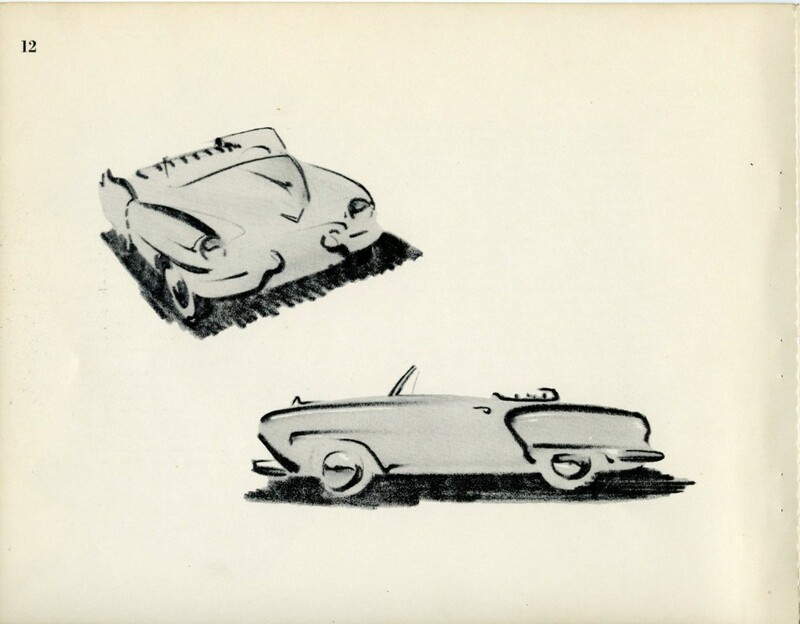 When men who love to draw cars are encouraged to “go wild” on original concepts, as they are in preliminary stages of design development, the resulting design expressions are often interesting. A selection of these dream-lined drawings, especially rendered by professionals, are shown in a solon section to acquaint the novice with the product for which he will be responsible as an advance-stylist. By unfolding his ability through practice in each fascinating step presented, from general perspective to highlighting chrome, the reader may complete this book with confidence in his accomplishment – and his future. The ethereal quality, arrested by the artist through these “rocket ship” renderings, sharply contrasts the futuristic design with the production design. In the case of a final dream-lined rendering which merits further consideration, mechanical limitations, seating comfort, handling convenience, safety, engineering changes, and interchangeability become prime considerations, necessarily bringing the rocket to earth. 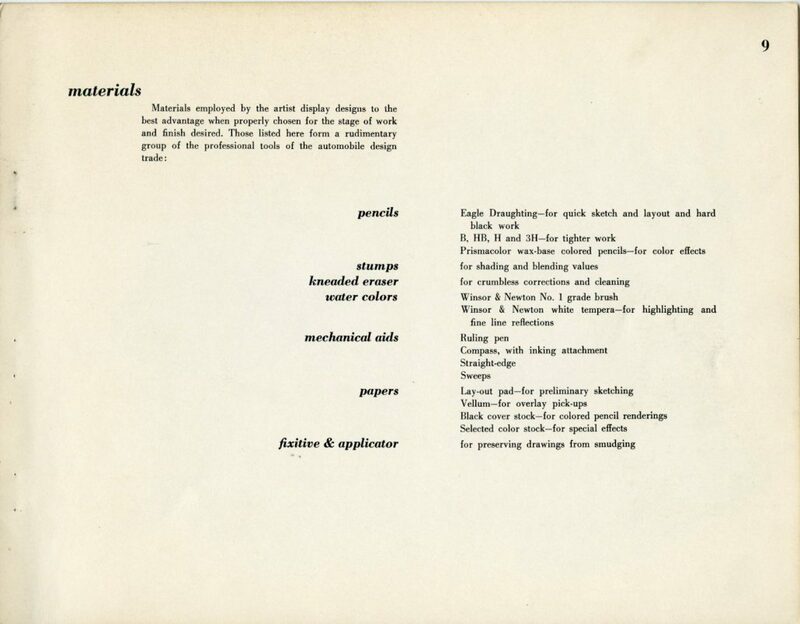 But the purpose of designing without restraint has been served, for such designs – ultimately taken into production form – retain, in some measure, a tethered reflection of the original conception. 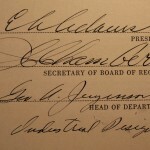 All in all, perhaps as many as two or three thousand sketches, similar to those shown, contribute just as many ideas toward an intricate composite finished design. Many thousands more – a by-product of the quest for drawings that hold definite possibilities for future application – are discarded along the way without further consideration. When showing merit, a dream design may be worked up in a one-quarter or three-eighths size clay model, which affords a three-dimensional study of design possibilities. Clay also allows changing and re-changing of contours to arrive at the most pleasing line. But the development of the design from the clay model – on through the many other interesting stages to the production line – is a romance apart. And with that….let’s look at the first 15 or so pages in today’s story on this book. Remember…..you can click on each picture below to make it appear larger on your screen. 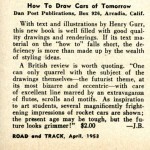 Note: More pages to follow of “How To Draw Cars of Tomorrow” (1952) in future stories here at Forgotten Fiberglass. 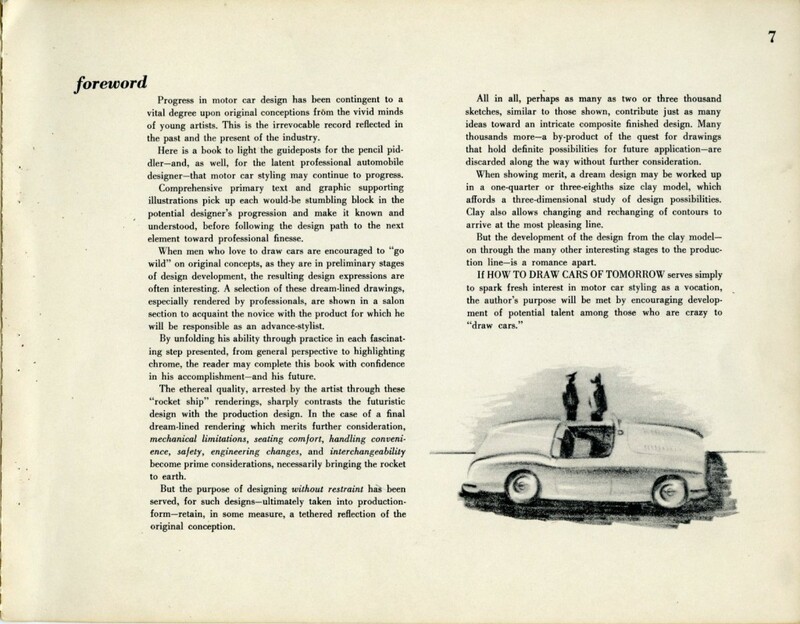 In hindsight, the publication of this design book in 1952 was a watershed moment in automotive design history. 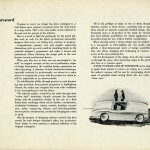 No one had attempted to bring together the knowledge and experience concerning the teaching of automobile design all under the cover of one book. This was a remarkable achievement – and Bob was just getting going in 1952 – remember he was just 21 years old. 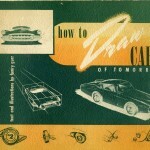 During our interview, Bob reminded me that another book was published at the same time (1952) and this was the book by Bill Jenks titled “You Can Draw Cars.” I’m in the process of researching more about the history of this book and look forward to reviewing its content and styling in a future story here at Forgotten Fiberglass. 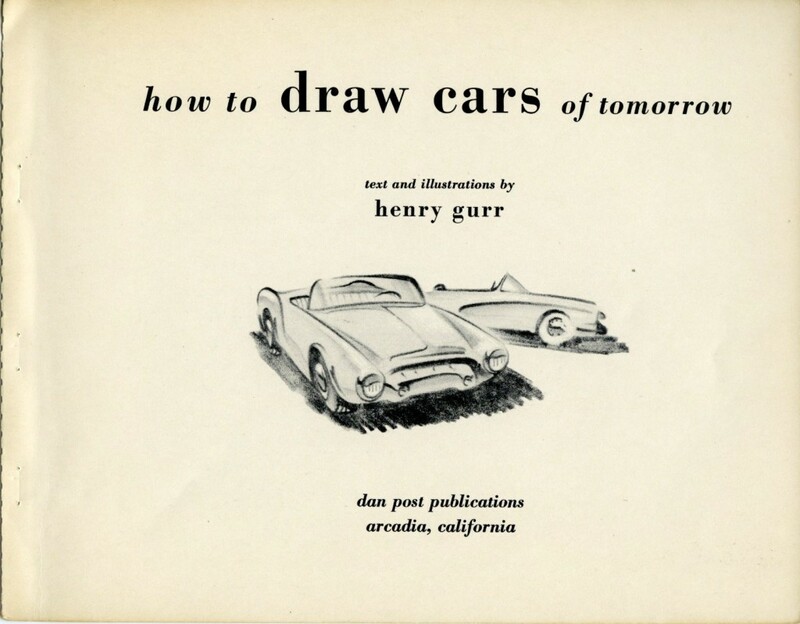 With text and illustrations by Henry Gurr, this new book is well filled with good quality drawings and renderings. 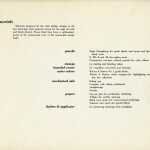 If its text material on the “how to” falls short, the deficiency is more than made up by the wealth of styling ideas. 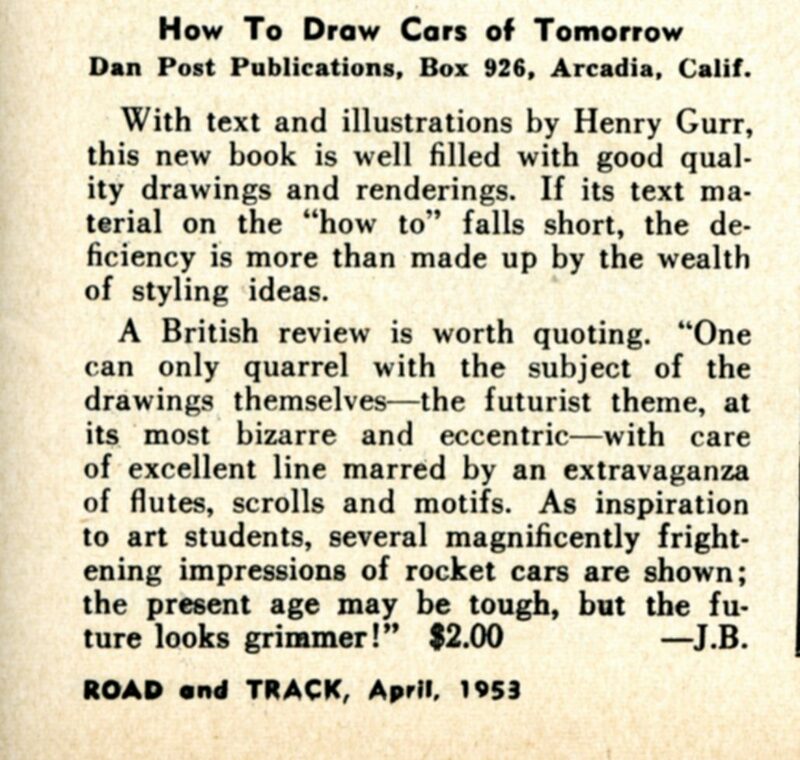 It sounds like the British publication was less than happy with the futuristic styling ideas that Bob presented in the book. My guess is that this would be a sign that he was exactly on the right track (and would later take these same ideas and implement them elsewhere including Disney). 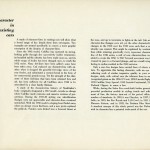 This really well-produced publication with soft leatherette covers, bearing a modern and pleasing design, enclosing 62 pages, each 11 inches by 8 and ½ inches, of high quality cartridge paper would appear, when first flicking over the pages, to be a light-hearted lesson for those interested in the bizarre. Closer inspection, however, of both the drawings and the text reveals that this is Henry Gurr’s last thought. 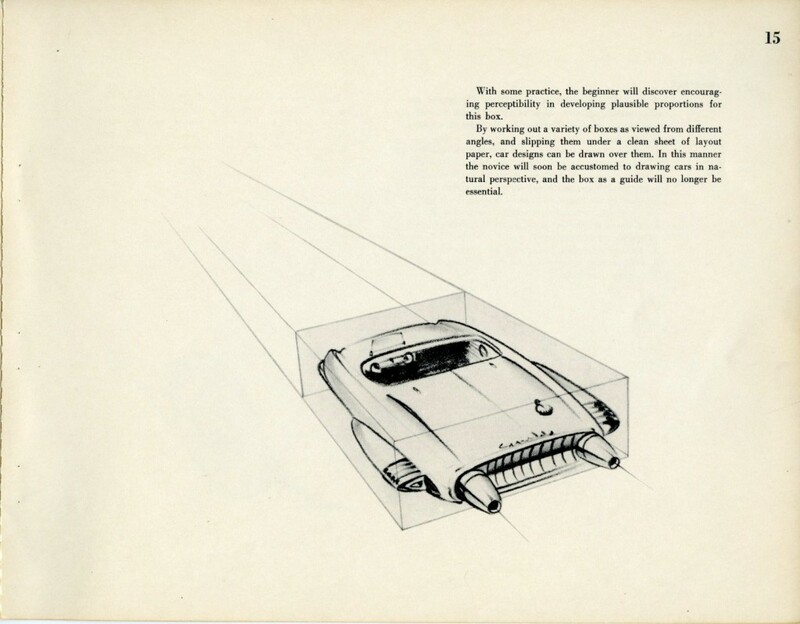 Himself a leading designer for one of America’s largest motor manufacturers, and I strongly suspect that ist is the General Motors Corporation, he points out that it is from this very futuristic type of drawing that practical designs are eventually evolved. Like many books of this nature, there is a section, after the foreword, detailing the drawing materials required and then follow the lessons on just how to produce a well-finished and well-balanced drawing in any one of several mediums. The last 24 pages of the book are devoted to the Salon, being the renderings of professional automobile designers, including himself. 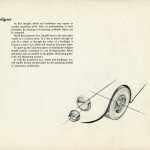 Before we come to this we find two interesting sections, one showing the critical dimensions in regard to headroom, foot room, wheel clearance, overhang, etc., and the other explaining the manufacturers’ point of view, in which some interesting revelations are made regarding various influences that regulate the design changes. This is a book that can both amuse the inveterate doodler, and perhaps produce some rather startling results, and be a guide for the latent professional automobile designer. 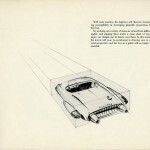 In my opinion there is one major omission: while indicating design limitations governed by headroom, foot room, etc., and other functional considerations, the author does not consider aerodynamics which, in the future, will almost certainly have more effect on design than any other single factor. The advanced aerodynamic saloons now being built in Italy are already showing the way. 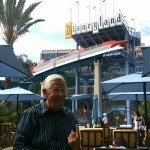 Here's Bob Gurr Showing Off A Replica of His First Disney Monorail - Used As A Waterslide at the Disney Hotel in Anaheim, California. 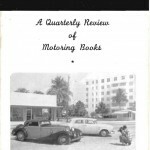 The book went on sale around July of 1952, 2 months after I arrived in Detroit. Dan Post sent a big box of books, which I signed and sold to a bunch of the stylists I was working with. This is the earliest ad I’ve found advertising Bob Gurr’s 1952 Book – This ad appeared in the January 1953 issue of Motor Trend. 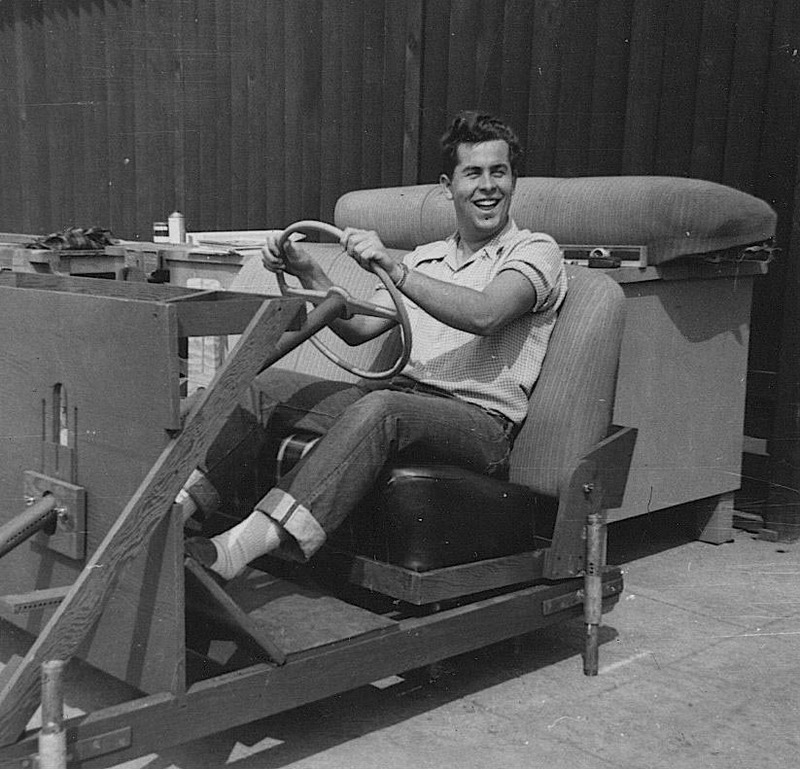 Here A Young 20 Something Bob Gurr Tests Out A Mock Up For Seating Dimensions at the Art Center – Circa 1950. Photo Courtesy of The Bob Gurr Collection. Mr. Gurr is not only an incredibly talented man, it would seem that he is a pretty fine and very approachable human being as well… I would love to meet him. Would be nice if someone would do a feature documentary about him and all the amazing things he has designed. Heck you could do an entire film on just the Disney part of his career. 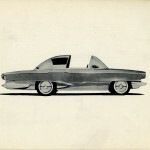 So began my career in car design. This and the Jenks book served me well until I arrived at Art Center in the early 1980s. Good job Bob Gurr. I suspect the minds and hearts of many young people were highly inspired by your book, much as I was. 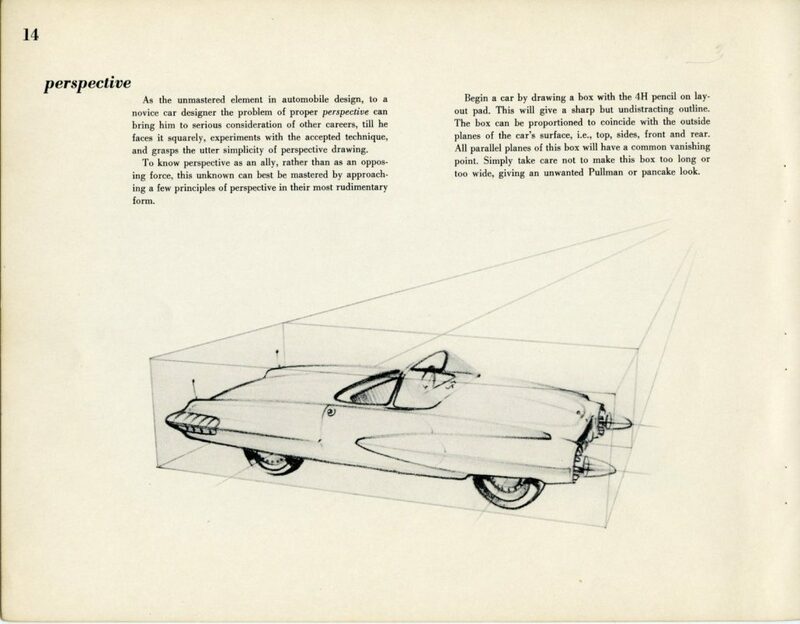 And for anyone still interested in car design – Bob’s rules of drawing still apply 60 years later. Bob Gurr is amazing. His potential appears to have remained as limitless today as it was 60 years ago. Thats a great book.I know I had it at one time..I can’t find it tho so I guess it got lost in all my moves.I know I would not have thrown it away.. I still own a copy that I had as a child. Not in the best condition, but I pull it out of my personal library at least once a year to enjoy it.